Lake Conditions - Lake Houston Fishing! Launched the boat today for the 1st time in 4 months at Dunnam and ran up Caney Creek to check out the motor. Water was 62, still pretty muddy but clearing, and current was running hard in Caney. 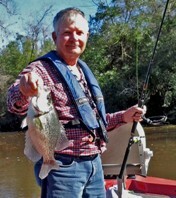 Back on water today in Caney and East Fork north of split. Water still muddy and 62. High current in East Fork and buddy went turtle twice in his yak coming south from 1485. Water temperature 55 in bayou.